Following the Graduation ceremony last week, I was surprised to receive a call from James who asked for a meeting. He was in the London Bridge area and, if I wasn’t busy, he’d like to pop in. I jumped to the conclusion that things were not going so well for him after all and he wanted to chat through options. How wrong was I? – very! Following the completion of Growing Talent 6, James started employment with Wilson James as a multi-site Security Guard. Working 12 hour shifts at multiple sites including a leading search engine organisation, gives him great experience. Things are going very well for him! He’s now enjoying a few days off and wanted to pop in during his Christmas shopping trip to say thank you for the support of Growing Talent! 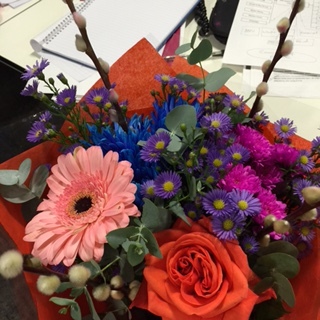 Apart from the beautiful flowers, James also brought a box of chocs which the office will enjoy! It’s great to be appreciated. Finding out how people we’ve helped are doing is a fantastic boost to our egos. Let’s remember to let people know how much their support has helped us – easy to forget yet simple to do.